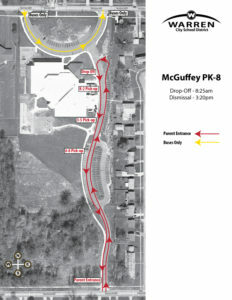 McGuffey Pk-8 School is located on Tod Ave in the Northwest quadrant of Warren. The school building was opened in 2010 and contains a full-service cafeteria, media center, gymnasium, art and music rooms, 2 science labs, and 3 computer labs. Additionally the building offers separate areas for various grade levels, including pods for grades pK-2, 3-5, and 6-8. Other features include large, state-of-the-art classrooms that support student learning, including special education services, updated technology resources, portable computer labs, and two playground areas. The faculty and staff of McGuffey School are comprised of over 100 caring and focused adults with a mission of creating a safe and effective environment for learning. We support a student body of approximately 750 students ranging from our preschool program through eighth grade. The lesson design and learner outcomes for our students are based upon the Common Core Standards in Math and Literacy, and the Ohio New Learning Standards for Science and Social Studies. This standards-based curriculum revolves around implementing effective instructional practices and assessment strategies to meet students’ differentiated learning styles and needs. Time is built into the daily schedule to provide staff professional development that demonstrates a commitment to educational success, ensuring that students are prepared to move on to the next level of their educational journey. In an effort to create well-rounded students McGuffey also supports a number of academic and athletic extra-curricular activities. The academic activities include Challenge 24, English Festival, Great Books Club, Spelling bee, National Junior Honor Society, Lego robotics teams, Science club, Junior Envirothon, Student council, and a Student news publication. Athletic opportunities exist for grades 5-8 in various sports such as football, volleyball, swimming, basketball, and track. Sixth through eighth grade students also have the opportunity to participate in a district supported intramural program. McGuffey promotes a positive school and learning environment through the Positive Behavior Intervention Support Program (PBIS). The school community challenges the students, parents, faculty, and staff to think and perform at high levels and exhibit positive character values. Supported by the district’s WARREN acronym, the PBIS program recognizes Work ethic, Accountability, Respect, Responsibility, Effective Behaviors, and No excuses. McGuffey provides a positive approach to discipline through the use of our Student Support Center (SSC). The SSC provides reinforcement for students in areas of behavior, academics, conflict resolution, skill replacement, and peer mediation. Expectations are clearly displayed in the classrooms and throughout the school. Classroom and student achievement are recognized monthly by incentives established to support these important characteristics, and quarterly awards assemblies are held to recognize student successes.